Built in the years AD122-30 by order of the Emperor Hadrian ‘to separate Romans from Barbarians’, Hadrian's Wall was 73 miles long, running from Wallsend-on-Tyne to Bowness on the Solway Firth. It was originally almost 5 metres high with 16 large forts along its length and is the largest Ancient Monument in northern Europe. Following the author’s previous successful book, Hadrian’s Wildlife has been enriched and expanded with additional information on wildlife and Roman history. When standing on the WHO site of Hadrian’s Wall, many visitors may wonder what the area would have looked like during Roman times. Bringing the bird remains from Roman digs into view reveals which species were living then as well as what the landscape looked like. Although some species such as White-tailed Eagle and Common Crane are no longer found here, others including Nuthatch, Hobby and Little Egret have colonized the area. 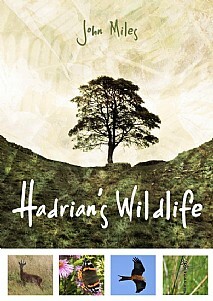 Living close to Hadrian’s Wall, the author has explored its many habitats from the Solway Firth across to the east coast. Many of these wildlife sites have a Roman influence from old forts to the gathering of pearls from the oysters that are found on the North Tyne. Hadrian’s Wildlife will encourage visitors to the area to enjoy and appreciate the wide selection of these habitats on a year-round basis. This invaluable guide to the many and varied attractions of the area will take the reader on a voyage of discovery and will be an essential companion for visitors. An invaluable guide for visitors to the area, so that they enjoy and appreciate all that the area has to offer.